john4jack (Corvallis, Oregon, United States) on 4 March 2009 in Animal & Insect and Portfolio. Taken with a P&S along the shoreline of the Straight of Juan de Fuca. Humility is what gives us the vision to look upon our world with fresh eyes. Humility enables us to respect others enough to put down our spurious images of ourselves and open our arms, as individuals and as a nation. Absolutely beautiful and fantastic - wonderful image - this eagle looks so proud and majestic - a great capture! Perfect capture here. Don't think I care for the border with this image, however. Beautiful capture :) What a fine eagle. Nice shot - he's a bit puffed up here! That's a beauty. Love the detail in the feathers. Wow, he is so beautiful - such a magnificent bird. I was walking along the beach one time and one flew overhead. The wingspan was amazing. Fabulous capture of a magnificent bird. The eagle's eye and head are tack sharp and the low angle makes him look even stronger. Love it! An very impressive bird, a marvelous photo!! Really nice portrait ! Respect for Sir Eagle ! This is fantastic ......... it may be a P & S, but one would never know it from it's clarity! Absolutely beautiful capture! I am amazed! this raptor is full of majesty. The sharpness and contrast are irresistible. This is a photo for National Geographic.What a fortunately, John, on your way to meet such a beautiful animal. He looks so majestuous and so beautiful on the vivid blue of the sky ! Wow! Jack, this is an incredible image! The details of the feathers and this colour is just amazing! He's got that "don't mess with me" look, that they all seem to have. Incredibly sharp and superb blue background, bravo! Stunning. I'm still trying to get this shot. Aren't they just majestic and beautiful? Great shot. Great presentaion. Like the border. Well done. Oh, he is lovely ... so beautiful to see them in the wild! The colors and lighting are great, maybe a touch too much denoise on the feathers? Perfect lighting. And the quote goes so well with shot. This is an excellent image! Love the angle of view--looking up at the eagle makes it more magestic. Great blue background. Also like the border used--works really well with this image. I think I will just hang up my SLR and use a P&S!! A wonderful close in view of this noble bird. A fine picture. 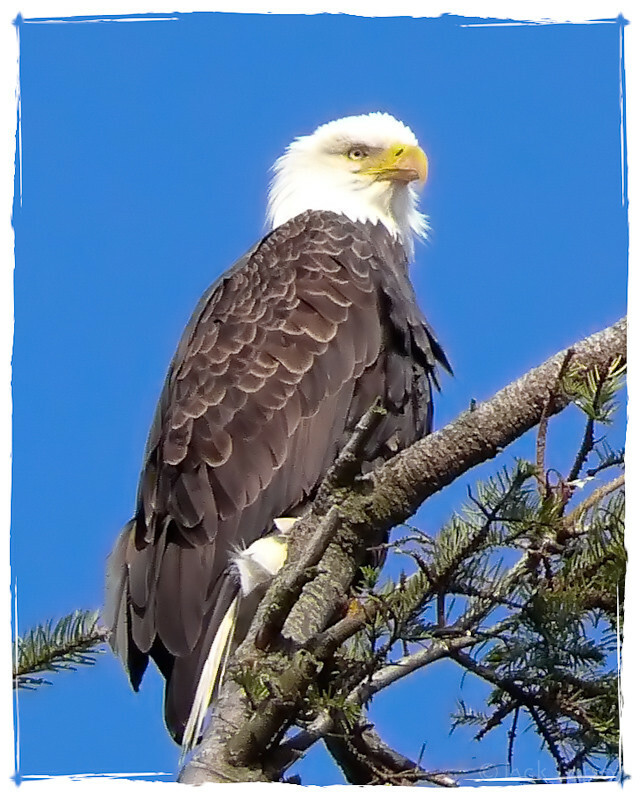 I so love Eagles, and as an Englishman, I can't tell you how utterly fantastic it feels to see Bald eagles close by whenever I visit my family in Western BC. I've yet to capture a half decent shot of one, but that's no matter when I see a photograph as fantastic as yours, Jack. @EYES WIDE SHUT: Thanks, Paul. There were two nesting spots close to where we lived in Sequim. That is a magnificent shot. What gorgeous birds. Really a great shot ! Very nice! @k@: Thank you, k; it is an incredibly majestic bird. Great regal shot of this magnificent bird. Is the sky a true color? or is it altered? @LauraS: It's been a few years since I took it, Laura, but I think that is accurate color; we certainly had lots of days with that color of blue. The only thing that I can recall about post-processing the sky is getting rid of some noise; it was quite a blow-up (which makes the sharpness of the P&S even more amazing; can't believe that I gave it to my son). Incredible detail and clarity in this espectacular bird portrait. Now you're just showing off! ;) Excellent! It is a magnificent specimen of the nature. Beautiful image. Beautiful specimen, P&S or otherwise!!! Great Catch!!! @Susan: You wouldn't believe the number of eagle shots I have dumped in the trash!! Stunning detail! How on earth did you get so close?! @willow: I wasn't that close; maybe 20 yds. away. I did one humongous crop. Couldn't believe how sharp it still was after the crop; amazing P&S. That is incredibly beautiful, Jack! magnificent bird, well captured. the processing gives it a painterly feel. That's a fantastic close-up of this majestic bird, well done. He´s really impressive! What a capture! Really impressive bird. Beautiful separation on the blue sky and nice frame. What a great shot, almost too perfect. These birds are so majestic, rarely seen our way , however are becoming a bit more populated with re-introduction about 20-25 years ago. Wonderful, Jack!!! Truly amazing the clarity of your crop. I'm hoping to get that close to one sometime soon with the cannon LOL!! Fabulous! Fabulous! How fortunate you were to capture this magnificent creature. Remarkable capture and great detail. Fantastic capture,lucky you to be able to see this guy in the wild !! Awesome Stunning colors and detail!! @Diane Schuller: He actually wasn't that close. It was a humongous blow-up! What amazes me to this day is how sharp it ended up. I am so late commenting on this fabulous photo, but I had to pop in and tell you how much I love this shot. Yes, 5 stars are in order. I can't tell you how many attempts I made to capture such a beautiful picture as this while cruising the San Juans with Dad & June a year and a half ago. I have several, but none with such sharp, vivid detail and color as this award-winning photo. Absolutely magnificent, Jack. I may just have to take a P&S on the next trip. @Lesley: Thanks, Les; the lenses on many P&Ss are excellent, and they often have outstanding telephoto range.